Harry Fraser Catering Services was founded in 1994 and after many consecutive years in the catering industry we have grown to be the most successful catering company in the area. We operate from two custom built units in Inverurie, Aberdeenshire from where we have catered for a variety of clients hosting a variety of events from weddings to private dining, catering for numbers from two to two thousand. We only use the best local produce and all our food is prepared fresh by our first class chefs making our menus provoke thoughts of luxury and indulgence. Our dedicated and professional staff are experts in the catering industry and thrive in the knowledge that we can offer excellence from the moment we receive your enquiry. Nothing is too much trouble and we will ensure your specific event is unique and diverse. 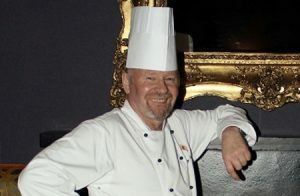 Harry Fraser began his career in the catering industry 38 years ago, after 17 years working at various high-class establishments he began Harry Fraser catering Services with the vision and desire to provide clients with the finest and most desirable cuisine in the North East. The company originally operated from Westhill doing both internal and outside catering before relocating to Inverurie to specialise in outside catering. The company has extensively expanded throughout the years and we are proud to have loyalty from our existing clientele as well as new customers on a weekly basis.